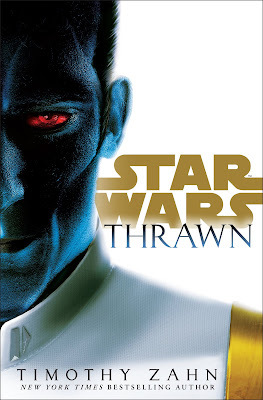 Del Rey Books and Lucasfilm publishing have released the first preview excerpt from the highly anticipated novel Star Wars: Thrawn. The novel is written by Timothy Zahn, and tells the canon backstory of the villain Grand Admiral Thrawn. Zahn created the character back in the 1990s for the novel Star Wars: Heir to the Empire, which brought Star Wars back to the bookshelves after a several year absence. Though those novels were rendered non-canon ("Legends"), the character's popularity led to him being introduced into the new canon the third season of the animated series Star Wars Rebels (where he voiced by House of Cards star Lars Mikkelsen). It was probably only five seconds. But to Eli it felt like a medium-sized eternity. The entire throne room was utterly still, utterly silent. The only sound was the thudding of his pulse in his ears, the only movement the shaking of his arms in his sleeves. Eli winced. A gift? For the Chiss of the stories, that would have been a deadly insult. Thrawn was behind him, and he didn’t dare turn around, but he could imagine the expression on that proud face. You can read the entire excerpt over at USA Today.